Main idea: Meekness is trusting that God will take care of you, no matter what. So you stand up for what is right, and you don’t seek revenge. You are humble, gentle, and kind. This is lesson 4 of 9 in this series. Use these links to find the whole series. Gather: Bible; dry erase markers or chart paper and markers; BEEATTITUDES poster; M&M candies; straws; bowls; colored pencils; yellow stamp pad or washable paint; black markers; diaper wipes or damp paper towels. Earth Printout & Coloring Page: Click on preview image above to download PDF. Take time to meditate on this week’s Scripture and think about your own life. Have you ever thought about meekness as strength, as a desirable characteristic? This week, practice being gentle, humble, kind, submitted to God’s will, and standing up for right without taking revenge or using harsh words. Gentle movements are the key to this game. There are several variations to this game. Choose what works best for your group. In every variation, the goal is to move M&M candies from one bowl to another by sucking through a straw and getting the M&M to stick to the end of the straw. When they stop sucking, the candy will fall. If they move too abruptly, the candy will fall. Any candies that fall onto the floor or table are trash and don’t count for any points. One variation is to give everyone their own small pack of M&Ms. The first kid to move all their candies from one bowl (or cup) to anther wins. You can also see how many M&Ms each kid can transfer in one minute. Try making a relay out of it. The first team to get all their candies from one bowl to another wins. A fourth option has everyone sit in a circle facing in. The first player gets as many M&Ms out of a big bowl and into their own bowl as they can, while the player to their left rolls a die. Once the player rolling the die rolls a 1, (or even number, or whatever you choose,) the first player stops taking M&Ms and passes the bowl to the player on their left. Play continues until everyone gets some M&Ms. This is not a good variation for a mixed age group, as younger kids may become upset when they can’t get as many M&Ms as the older kids. If you want to avoid candy, make little bees out of cardstock or construction paper. (Two inches across should be good. If they are too big, the kids won’t be able to hold onto them with the straw.) Put all the paper bees in a stack or in a bowl, and the kids have to try to move the bees from one place to another by sucking on the end of a straw and getting the bee to stick to the other end. So what is the third Beatitude? (Have a student answer.) The third Beatitude is “Blessed are the meek, for they will inherit the earth.” (Write MEEK on the board.) Meek is a little word with a big meaning! Most people today don’t really understand what Jesus meant by “meek.” The word meek means something different today than it did when Jesus used it. The world tells us that it isn’t a good thing to be meek. They think meek means weak, when it doesn’t at all! The word meek is pretty cool. Once we understand what Jesus means by meek, we will have a better chance at being meek. Let’s take a look at part of Psalm 37. Chances are, Jesus may have been thinking about this very passage as he taught today’s Beatitude. Follow along as I read Psalm 37:5-11. This passage paints a pretty good picture of what it means to be meek. We see in verse 5 that the meek person commits his way to the Lord and trusts in him. Sometimes it can be easy to think that we know best and that we can manage things all by ourselves. But that’s a ME attitude, not a BEE attitude! Meek people trust that God knows best, and they follow him. (Write FOLLOW GOD on the board.) What does verse 7 tell us meek people do? (Allow a student to answer.) Verse 7 tells us to be still before the Lord and wait patiently for him. The patience this passage is talking about refers to patiently waiting for the Lord to deal with people. I don’t know about you, but sometimes I can get really annoyed when I see people who do bad things getting their way. Sometimes people get rich by stealing or they seem to have a good life even though they don’t follow God. I want to ask God to punish them! I want these people to get what they deserve! But that is NOT being meek. That’s having a ME attitude, not a BEE attitude. Sometimes wicked and evil people win or get good things. Sometimes people can even say mean things to you because you are a Christian, and they get away with it! God does not want us to lash out angrily at people. We aren’t supposed to be like Batman, who takes justice into his own hands. When we are meek, we trust that God will do justice. Now this does NOT mean that you should ignore it if someone is hurting you. If someone is bullying or hurting you in any way, tell someone you trust. Being meek does NOT mean you let yourself get beat up. It means you let God take care of that person’s punishment instead of getting angry and fighting back. If someone is hurting you, tell someone you trust and let them help you. (On the board, right NO REVENGE.) When you are meek, you do not seek revenge on someone who did something wrong. So being meek is submitting to God and trusting him. It is staying calm when people do wrong things. But that does not mean you never get angry, or that you don’t stand up for what’s right. There are two people in the Bible who are called meek. Does anyone want to guess who? (Allow children to guess.) Moses and Jesus are the only two people in the whole Bible to be called meek. Now sometimes meek shows up in the Bible as “humble,” or “gentle,” but they mean the same things. Let’s do a sword drill to see what the Bible has to say about Moses being meek. Take all bookmarks and fingers out of your Bible and hold them over your heads. When I say go, look up Numbers 12:3. Go! (Read, or have a student read, Numbers 12:3.) “Now Moses was a very humble man, more humble than anyone else on the face of the earth.” In this passage, Aaron and Miriam are coming up against Moses to criticize him. Instead of fighting back or calling them liars, Moses lets the Lord defend him. Moses was humble, or meek, and he submitted to letting God be in charge. Now let’s look at examples of Jesus being meek. Let’s start with another sword drill. Take all bookmarks and fingers out of your Bible and hold them over your heads. When I say go, look up Matthew 11:29. Go! (Read, or have a student read, Matthew 11:29.) “Take my yoke upon you and learn from me, for I am gentle and humble in heart, and you will find rest for your souls.” The gentle and humble here mean that Jesus is meek. He is the perfect example of meekness! So all we need to do to learn to be meek is follow Jesus and learn from him. That’s a lesson that will take a lifetime! For now, let’s just look at two events from Jesus’ life that can help us to understand meekness. First read with me from John 2:13-16. “When it was almost time for the Jewish Passover, Jesus went up to Jerusalem. 14 In the temple courts he found people selling cattle, sheep and doves, and others sitting at tables exchanging money. 15 So he made a whip out of cords, and drove all from the temple courts, both sheep and cattle; he scattered the coins of the money changers and overturned their tables. 16 To those who sold doves he said, “Get these out of here! Stop turning my Father’s house into a market!” In this scene, Jesus goes to the temple to find that people have turned a place made to worship God into a shopping mall! A ME attitude could have ignored that these people were doing wrong, but a BEE attitude stands up for what’s right. (On the board, write STAND FOR TRUTH.) So meek people don’t get back at others for doing wrong things to them, but they do what is right and say what is right. Sometimes people say things that go against what the Bible says. The easy thing would be to pretend that we agree with them, but the right thing is to tell the truth about God’s love, and to do so kindly. Colossians 4:6 says, “Let your conversation be always full of grace, seasoned with salt, so that you may know how to answer everyone.” So meek people speak kindly. We’re going to look at one more scene from Jesus’ life to get a feeling for what it means to be meek. I’m going to read a few different passages of Scripture now. There’s no need to turn to them in your Bible. Close your eyes if you would like, and just follow along. What event are these verses talking about? (Allow a student to answer.) Of course, we are talking about the crucifixion, when Jesus died on the cross for all our sins. This is the ultimate show of meekness. Jesus is GOD. He didn’t have to die, he chose to. He chose to follow God’s will, even when it was hard, even when wicked people seemed to be succeeding in doing wicked things, Jesus stood up for what is right. He didn’t yell or get mad. He just did his Father’s will, knowing that the Lord makes everything work out for the best. In this case, it means our salvation! Let’s not forget about the blessing God gives us when we follow the example of Moses and Jesus by being meek. 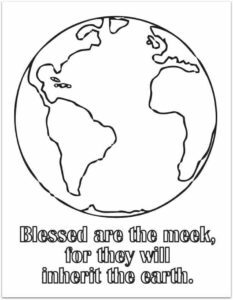 Matthew 5:5 says that when we are meek, we will inherit the earth! So what does that mean? Romans 8:17 helps clear it up. It says, “Now if we are children, then we are heirs—heirs of God and co-heirs with Christ, if indeed we share in his sufferings in order that we may also share in his glory.” This is saying that when we are children of the Lord, when we are meek, we get the same things as Jesus. We get to be princes and princesses! All of our needs will be filled and then some, when we stand for what is right without getting even or taking revenge. When we trust in God and submit to him, he gives us all the riches a king gives to a prince or princess! When we are meek, we become spiritually rich and get to spend all of forever in heaven with Jesus! Have kids color the globe picture with colored pencils. Once they finish, have them press their thumb into a yellow stamp pad or a small amount of yellow paint. Press yellow thumbprints all over the world. Wash hands (diaper wipes work fine for this), then use a black marker to add wings, stripes, legs, antennae, and faces to the bee thumbprints. You can make your own stamp pads by sprinkling a tiny amount of salt on a heavy duty paper (or plastic) plate or pie tin. Mix in some paint. The salt thins the paint out a bit and makes it easier to stamp. Cover the paint with a piece of felt and gently press down. The paint will soak through the felt and allow just enough paint for stamping. This will help keep the kids from getting too much paint on their hands. These Bee-Attitude lessons are fabulous – highly Biblical, age appropriate, creative and engaging for children. Thank you so much for sharing God’s word freely and inspirationally so that I too can bless the children in my local church. You have been a true blessing to me and my 15 children. Tony Kummer (Editor) reviewed & updated this page on : February 14, 2019 at 7:52 pm. All our content is peer reviewed by our readers, simply leave a comment on any post suggest an update.